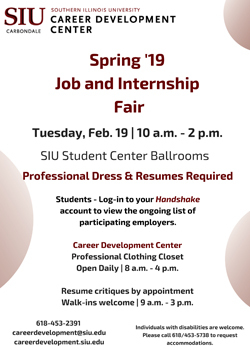 Southern Illinois University Carbondale has some upcoming events during the spring 2019 semester to help students and alumni hone their resumes, sharpen their interviewing skills and line up potential job opportunities. The university’s spring 2019 Job and Internship Fair is from 10 a.m. to 2 p.m., Feb. 19, in the Student Center Ballrooms. Admission is free for students and alumni. Those who attend should be professionally dressed and bring multiple copies of their resumes. As of now, 90 employers are attending. Career Development is sponsoring several events over the next two months to assist students and alumni. For more information on these events, or for faculty and staff who are interested in being involved, contact the Career Development Center at 618/453-2391. Wednesday – Writing Winning Resumes. Jan 30 – Engaging Interviews. Feb. 6 – How to Work a Job Fair. Each of the workshops are from 3 to 4 p.m. in the Student Services Building, Room 170. Participants may attend all or one of the workshops. Feb. 10 – 6:30-9:30 p.m.,J.C. Penney, University Mall, Carbondale. Co-sponsored by J.C. Penney, students and family members receive an extra 40 percent off select men’s and women’s career dress apparel and shoes. Students must show their SIU ID to receive a special discount card. Feb. 12-14 – 10 a.m. -2 p.m.
Student Center, North Hallway, First Floor. Career Development staff will offer brief resume critiques to all students. Bring a printed copy of your resume and receive immediate feedback. Career Development staff will be available to help refine and revamp your resume for three days. 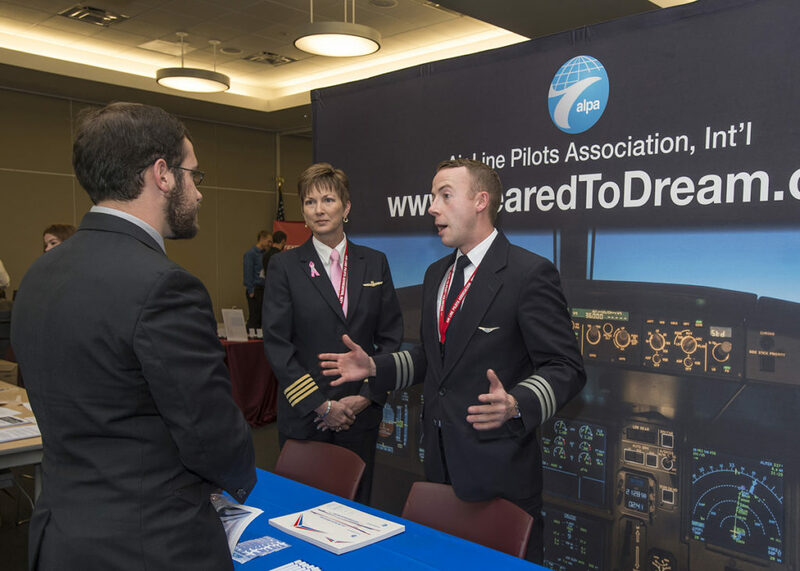 Feb. 19 – 10 a.m.-2 p.m. Student Center Ballrooms. The Job and Internship Fair is open to students in all academic programs. Admission is free for students and alumni. Those who attend should be professionally dressed and bring multiple copies of their resume. You Have a Job! Now What?! March 27 – 3-4 p.m., Student Services Building, Room 150. The Career Development Center is hosting a new workshop that focuses on how to create a road map for success by having participants create their own onboarding plan for the first 90 days in their new job. April 2 – 5-7 p.m.,Student Center Ballrooms. Learn the fine rules of dining while practicing networking skills. This dinner will help students develop the confidence and knowledge needed to impress a prospective employer during a meal interview. Due to generous donations from the Alumni Association and the Southern Illinois Professional Management Association, the first six students to register will be able to participate free of charge. Registration for the dinner is on the Career Development website. For more information, email careeerdevelopment@siu.edu.